There should be no need to remind anyone in the UK that today, the eleventh day of the eleventh month is Remembrance Day. The poppy, symbol of remembrance is worn on the left side, over the heart by the wearer in remembrance of those men and women that have given their lives for our country. During the first world war, in Flanders (Western Belgium), most of this expanse of land was ripped apart, towns, landmarks, vegetation were systematically eradicated from existence by artillery bombardment. The land was turned into a sea of mud, in this mud men continued to fight one another whilst surrounded by the dead and dying. Each new artillery bombardment would churn the muddy ground revealing corpses of lost soldiers – a truly horrific sight for the young men that continued to fight the war of attrition. 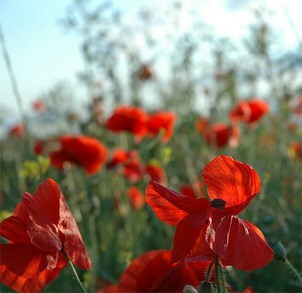 During each coming spring an enduring flower would appear, the poppy. Poppies only grow from freshly churned soil, the war torn landscape being the perfect environment for them to germinate, they grew in such abundance on the battlefields that it was superstitiously believed that each one was grown from the soul of a fallen soldier. Today we do not simply reflect on the human atrocity conducted during the first world war, Remembrance Day is about all wars that have taken lives, on both sides. With all of our advances in culture, science, medicine, philosophy it’s hard to comprehend why we continue to kill one another, but it seems part of our nature for now. But, for all of our misgivings there is no reason why we should ever forget those men and women who have laid down their lives for our country, our freedom and peace. This coming remembrance Sunday, raise your glass to the fallen. Or, instead of buying that pint, consider giving the money to help our veterans, you can donate at www.poppy.org.uk. 1. The sausage is an ancient form of food, pre-dating most historical cultures, the Sumerians were believed to have cooked the first sausages over 5,000 years ago. 3. The worlds longest sausage weighed in at 15.5 tonnes, and measured 35miles long. Unfortunately never officially adjudicated by the Guinness World records – who recognise a measly 1,500m German sausage as the record holder, our British 35 mile long masterpiece will not be forgotten. 4. Sausages are a product of efficient butchery. Butchers use parts of the pig that are both edible and nutritious to make sausages, these ‘parts’ including organs, blood and fat would normally go to waste, seen as unsavoury by consumers, wrap it all up in a sausage format and you’ve got Britains number one home cooked meal. 5. 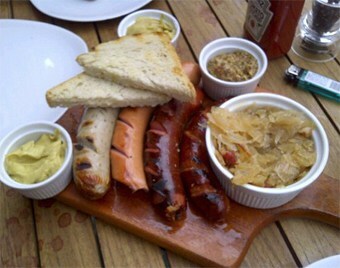 The Frankfurter was a sausage made by a German butcher in the image of his pet Dachshund (sausage dog), in 1906, American cartoonist Ted Dorgan produced a painting of a dog in a bread roll covered in mustard to commemorate the German butchers sausage invention, unable to spell Dachshund Ted called it “hot dog”. The name seemed to stick. If you’re in the Twickenham area, you might want to get yourself down to the Rifleman they have organised a Beer, Cider and Sausage Festival. If you’ve got any sausage facts, recipies or just want to talk sausage leave a comment in our comments section below or join in the conversation on our Facebook page. Cheers!